Winter is the season for warming, filling food. Our ancestors needed it to keep themselves warm during long hard winters but while we might have the benefit of better heating our appetite for recipes like casseroles, stews and the aptly-named hotpot hasn’t diminished. And why should it when they make such delicious family suppers? With a slow-cooker, you can pop the ingredients in before you go to work in the morning and your reward on coming home after a hard day is to be greeted by a yummy smell and meat that melts in your mouth. If you don’t have a slow cooker, these dishes can be prepared in advance, frozen and reheated. All you need to do while they’re warming up is get the family to help prepare some of the lovely fresh seasonal vegetables around during winter. Beautiful green cabbage, thinly sliced, needs only a couple of minutes in the pan before being tossed in butter or olive oil and seasoned with plenty of freshly ground pepper. Or try some variations like curly kale, or purple sprouting broccoli. Leeks, cleaned and finely sliced, can be quickly stir-fried, with seasoning in a little olive oil, for a simple and healthy addition to a family supper. Your family will love these suppers and you’ll love the simplicity of the recipes! Pre-heat the oven to 160oC, gas mark 3. 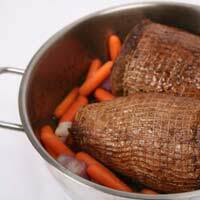 Heat the oil in a large oven-proof casserole dish and quickly fry the beef on all sides to brown. Set aside. Add the vegetables to the pan and toss to coat. Allow to cook gently for a few minutes. Add the wine, which should just cover the vegetables, and bring to the boil. Reduce to a simmer and place the joint on top of the vegetables. Add the bay leaf, cover and cook in the oven for about 2-2½ hours. When the meat is cooked, lift it from the pan and keep warm. Discard the bay leaf. Add about ½ pint stock to the pan. Mix the cornflour to a paste with a little water and stir into the liquid in the pan, until it boils and thickens. Add seasoning if necessary. Slice the meat thickly and serve on top of a helping of the vegetables with gravy poured over. Serve extra vegetables as well. Red cabbage is in season now and is an ideal candidate for slow cooking and with its sweet and sour flavours makes the perfect accompaniment for pork in this recipe. Season the meat well. Heat the oil in a large oven-proof casserole dish. Fry the joint of pork quickly on all sides to brown. Set aside. Add the vegetables and caraway seeds to the pan and stir well to coat in oil. Allow to fry gently for a few minutes. Mix together the vinegar, wine and sugar and pour over the vegetables. Return the pork to the pan, cover and cook for 2 hours or until the pork is thoroughly cooked. To prepare the cabbage cut into quarters. Cut out the thick core. Slice thinly. Cook a large quantity of the cabbage and apple base and freeze for use with pork chops or cold meats. This slow-braising method can be adapted for different cuts of meat. Vary the vegetables according to what’s around.